List Different Editions of Sorry! 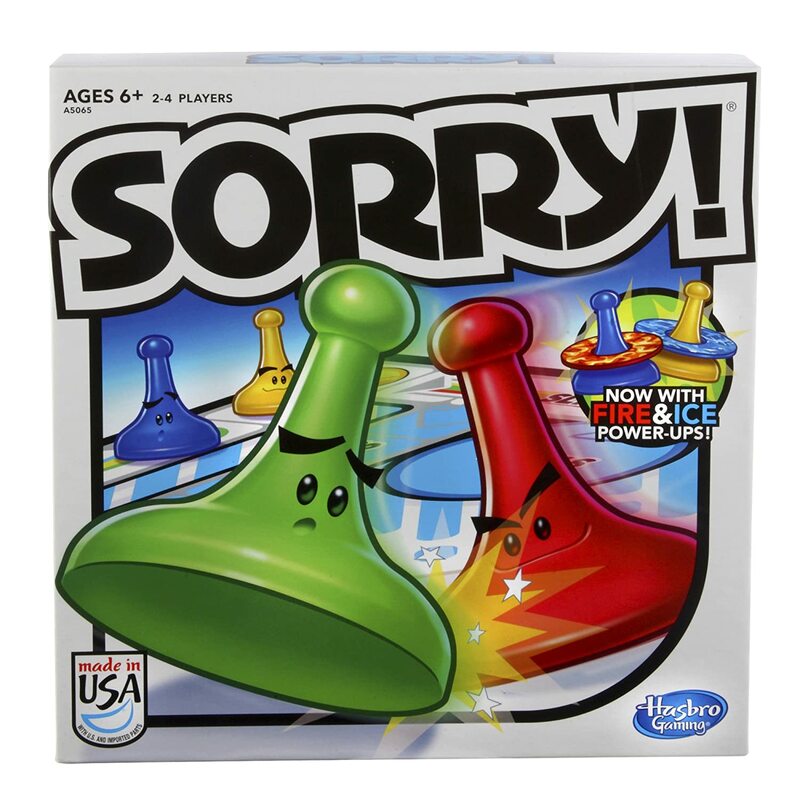 Slide, collide and score to win the game of Sorry! Draw cards to see how far you get to move one of your pawns on the board. If you land on a Slide you can zip to the end and bump your opponents' pawns – or your own! Jump over pawns and hide in your Safety zone while getting powers with the 2 power-up tokens. Keep on moving and bumping until you get all three of your pawns from your color Start to your color Home. But watch out, because if you get bumped, Sorry! Sorry! Sliders has put a fun, new twist on the all-time favorite game by turning it into a shuffle board game of sorts--where players slide their pawns to home, or slide their opponents pawns into the Sorry! spaces and off the board to win. Designed for children ages six and up, Sorry! 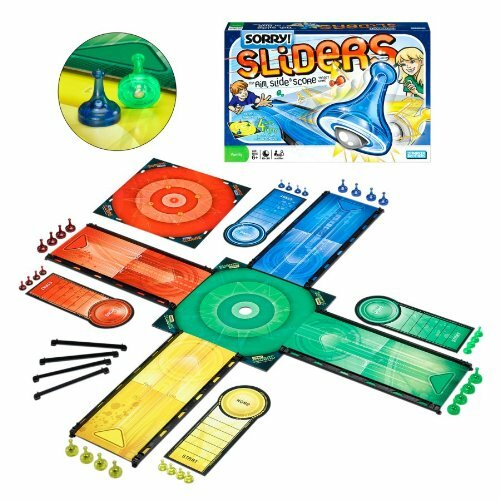 Sliders can be played with up to four players, making it the perfect game for family nights. 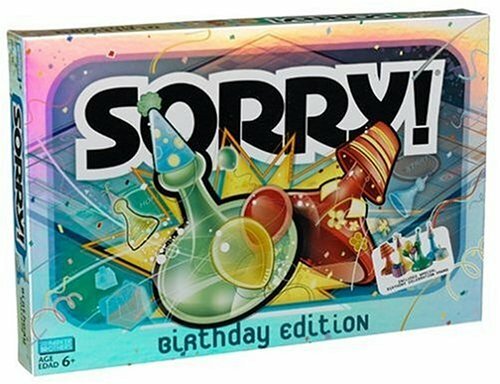 The unpredictable and challenging fun of the Sorry! game now combines with the excitement of the Star Wars universe! The Millennium Falcon is in hiding while its hyperdrive is being repaired, but the Dark Side is closing in, and the crew is in danger. 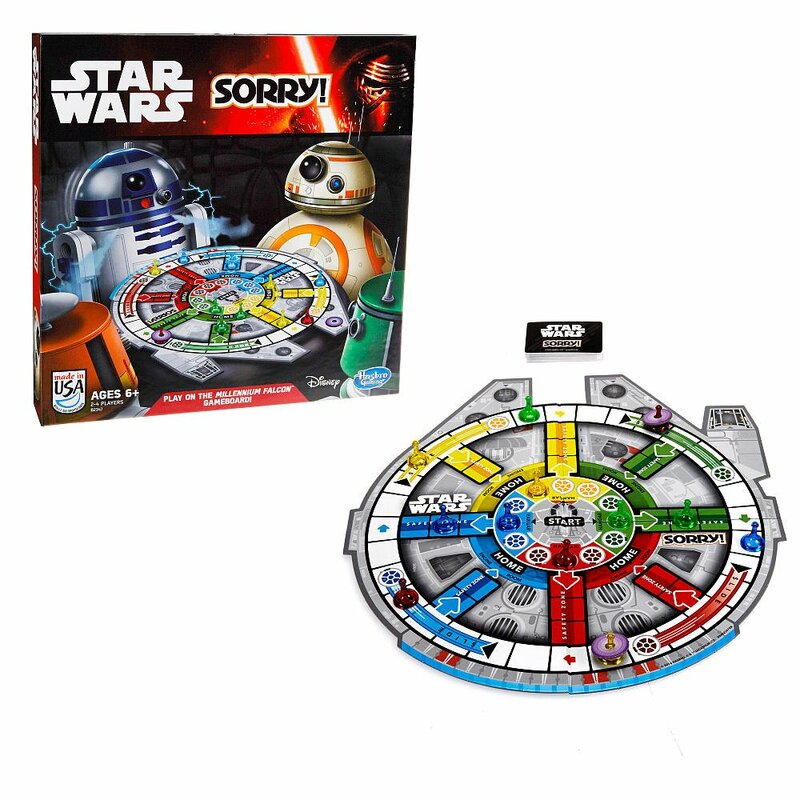 Players move their pawns -- or droids -- around the Millennium Falcon gameboard as they try to save the Millennium Falcon and help the crew escape. The game includes classic bump-and-jump gameplay and introduces deflector shield tokens that help protect droids in their quest to save the day. 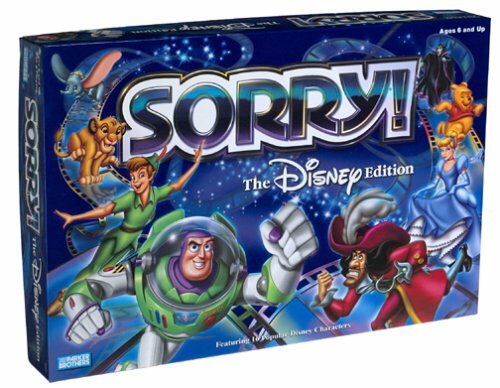 Sorry!, a classic family favorite, is now enhanced with Disney characters and spell-binding powers. Special cards can magically advance an entire team or send them into retreat. It's a chase and a race, and it's not over until Tarzan, Ariel, Captain Hook or Pooh gets his or her team all the way home. Includes: 20" x 20" game board, deck of cards, 16 Disney movers and stands and instructions. In this Special Edition of the game of sweet revenge, join Spider-Man, New Goblin, Venom and Sandman in a race from Start to Home. Run, jump and slide around the gameboard to get your team home before your opponents do. You may hit a few bumps along the way - sorry! But that's the fun and excitement that has made this classic game a family favorite over the years. Gameboard comes with deck of cards, 16 Spider-Man movers and stands, and instructions. 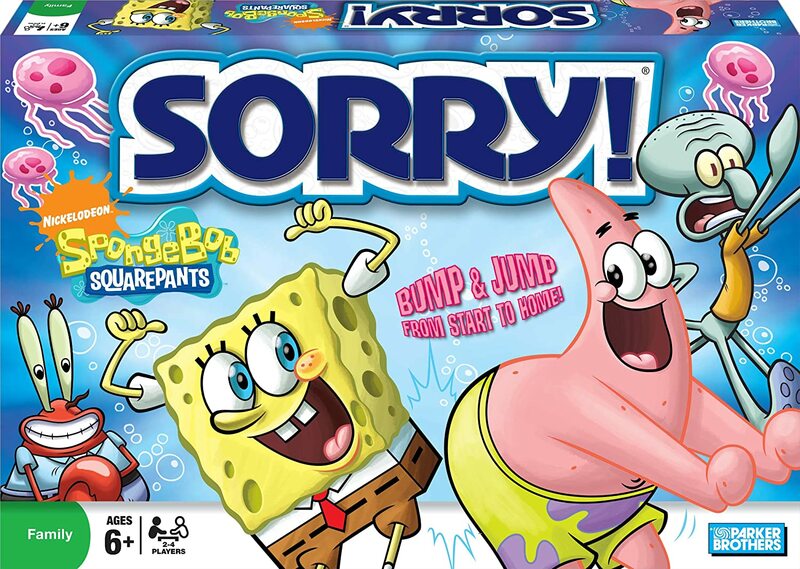 Join your buddies from Bikini Bottom in an exciting "game of sweet revenge" with this SpongeBob SquarePants™ version of Sorry!® Since 1934, players of all ages have been chasing one another around the gameboard, trying to get their own pawns from Start to Home. But it's not easy, because you never know what the next card will hold. Will you move forward or backward? Will you hit a slide and shoot ahead or will an opponent bump you back? Sorry, Springfield, but things will never be the same! 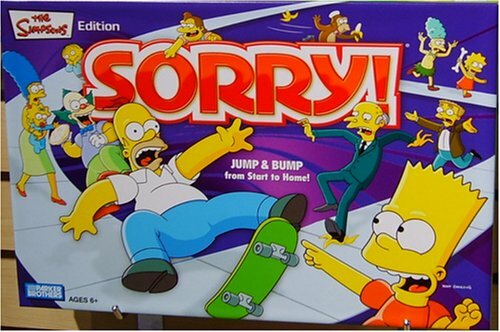 Compete in the ultimate game of SORRY with America's favorite TV family. Race home with your favorite Madagascar characters. 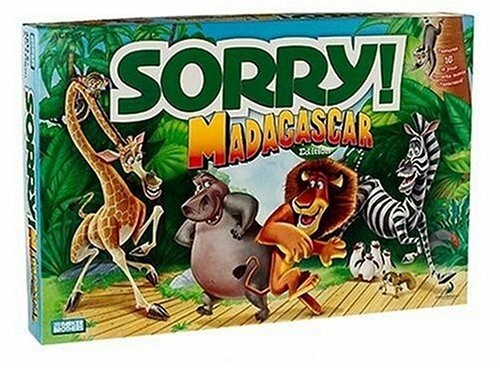 In this special edition of "the game of sweet revenge," you'll join Marty and all of his friends on the island of Madagascar in a wild race to get home sweet home. Run, run, run as fast as you can all around the gameboard, and get your team of characters all home before your opponents do. You could get lucky and slide ahead. But watch out - if you're not careful, your opponents may bump you back a bit. 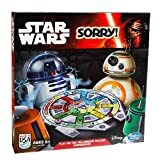 But that's the fun and excitement that has made the classic Sorry! game a family favorite over the years. It's traditional Sorry! gameplay with added twists. Includes game board, deck of cards, 16 Madagascar movers and stands and instructions. 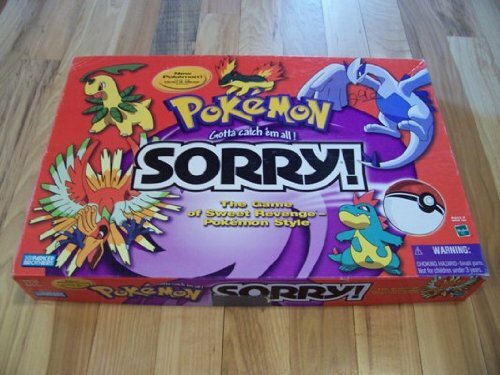 Pokemon version of the classic game of Sorry! Includes all the pieces and a perfect addition to your board game collection! Every Pokemon collector should own this limited edition Pokemon Collector's board game. The game of sweet revenge PARTY STYLE! Since 1934 players of all ages have been chasing one another around the classic gamboard, trying to get their own four pawns from Start to Home. This birthday edition celebrates all those years of fun with festive pawns and a colorful party gameboard. So put on your party hat and get ready because anything can happen! The next card may move you ahead or send you backwards. You could hit a slide and shoot forward, or an opponent may bump you back to Start. SORRY! The party doesn't end until somebody gets all the way home! 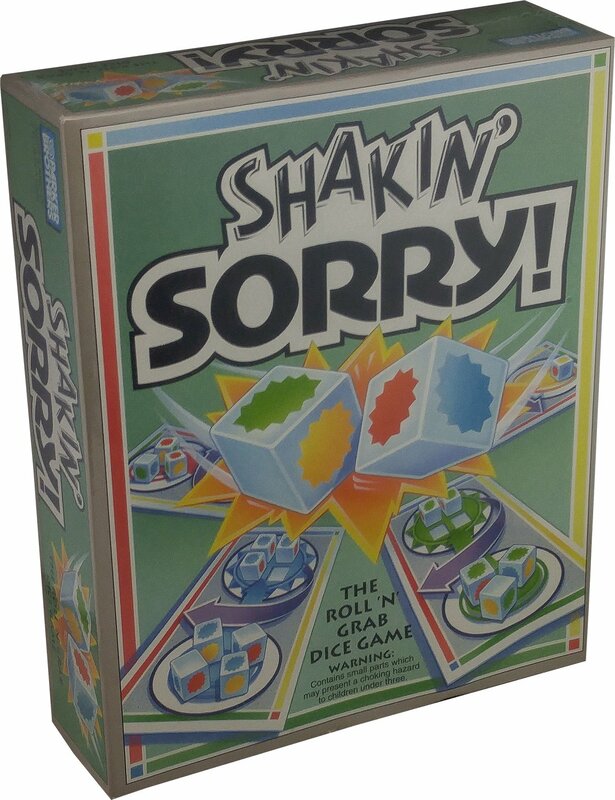 It's SHAKIN' SORRY!, the fast-playing Roll' n' Grab dice game! Shake the cup full of color-coded dice, roll 'em out and join in the grab-fest as you all try to capture your own color. Everybody's trying to be 1st to get 4 dice into the HOME section of their game board. Every time you roll, you'll roll a different number of dice, so the odds are always changing, and there's no telling who'll get what when. 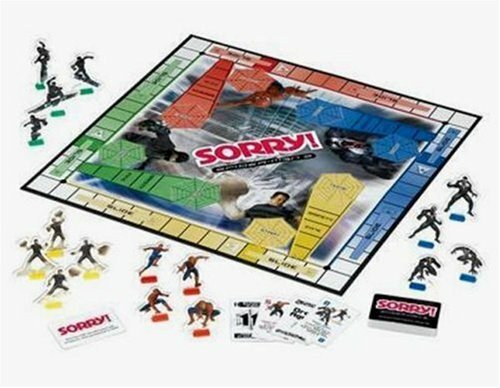 And just like the classic SORRY! 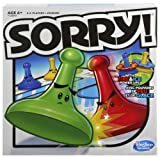 board game, when Slide or Sorry! pop-up, there'll be some fast turn-a rounds.